Tart, green tomatillos are perfect for cutting the richness of pork — a favorite stewing meat and a popular meat in Mexico. 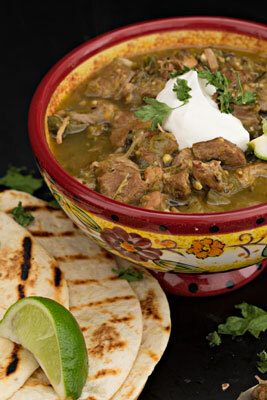 What makes this dish typically Mexican is its focus on chiles rather than beans. To round out the meal, serve with warm tortillas and Red Rice, which provides a delightful contrast. Generously season the pork with salt and pepper. Lightly coat with the flour. Heat the oil in a large, heavy skillet over medium-high heat. Fry the pork in small batches until well browned on all sides. With a slotted spoon or tongs, transfer the pork to a wide, heavy soup pot. Drain the fat from the pan. Place the onions in the same skillet and cook over moderate heat, stirring occasionally, until limp, about 5 minutes. Add the poblano chiles and jalapeños and cook for 4 minutes longer. Stir in the garlic and cook for about 2 minutes longer. Transfer the onion-chile mixture to the pot with the pork. Add the tomatillos, oregano, cumin, and cilantro. Pour in the chicken stock and bring to a boil. Reduce to a simmer and cook, uncovered, for 2 hours, or until the pork is fork tender. Adjust the seasonings with salt and pepper. To turn your green chile red, substitute 2 red bell peppers for the poblanos, 1-1⁄2 pounds tomatoes for the tomatillos, and 3 tablespoons ground red chile for the jalapeños and eliminate the cilantro.